I didn’t wake up one day and decide to be a bartender. It was a job that just came into my life at school and carried me through college. Pulling pints became my bread and butter and I was pretty good at it. To be a great barmaid you need to be a bit bolshy. Dealing with a wide myriad of customers, it is a given that some will be difficult or drunk or both. I therefore rank confidence as one of the highest ranking qualities necessary to be a good bar person. The actual physical act of pulling a good pint comes second. 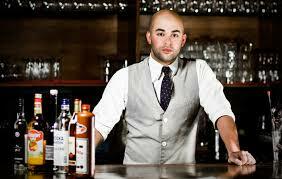 To be honest, most of your clients will overlook bad bar technical skills if you are friendly, bubbly and outgoing. Many take a trip to the pub for an escape and a friendly ear. For almost ten years I was that ear. From a young age I learned the psychology behind earning a tip. Listen to your customer, maybe indulge in some harmless flirting but always offer top notch service. I worked in local pubs in Ireland and began my career as a very shy fifteen year old waitress. Three years on and I was a fully-fledged barmaid, indoctrinated into the cliché by way of a bottle bin. As in, I was thrown into a bottle bin. This is the beauty with bar jobs. There is none of the very professional front necessary as there is with white collar roles. A performance review is done over a schooner, a sickie brought on by a heavy night on the tiles is totally acceptable and work just feels like a great night out without the hangover. It’s not all good though. Being a bar lady brings with it great responsibility. To break the law regarding the service of alcohol is detrimental to any pub. It brings with it hefty fines, a bad rep and possible closure. Thus, as a bar person it is vital that you have respect for the duties that you bestow. There is also the aspect that involves providing a listening ear when necessary and sometimes you just might not be in the mood. If you’re having a bad day you can’t really take it to work because you work in front of an audience. Aside from the bad points, overall being a barmaid is an incredibly fun job. It is extremely sociable and sometimes profitable, While your earnings might not be very high there is always an opportunity to make tips on top which can see you through those dark college days. Working in a pub usually involves working weekends which can sometimes have a bright side. It is helpful if you want to avoid the temptations of going out and blowing your weeks wages with your mates. Working in a bar usually provides opportunity for overtime and ability to be flexible with working hours. It is the perfect companion for a college student or someone who cannot commit to a full time role. There is room for growth if that’s what you are after. Often supervisory or manager positions such is the transience of bar positions. Also, gaining bar experience ensures that you have portable skills which come in very handy when travelling. Thus far, I have used my bar skills in three countries, from Ireland through to Australia. I have worked in everything from novelty Irish pubs in Portugal to trendy cocktail bars in Dublin. The world might not have a universal language but a bar man does. What are your experiences of bar work? Any tips for gaining bar experience?